Remember last week when I said that shopping on sale with coupons can net you a lower out of pocket price than buying the store brand? Well here is a great example of that. Target has organic milk on sale this week. Horizon brand is $3.34 for 1/2 gallon. Archer Farms (the Target brand) is $2.99 for 1/2 gallon. At first glance, it seems the store brand wins out… but wait! 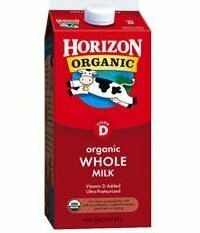 There is a printable $.50 off coupon for Horizon milk, making the Horizon brand just $2.84 for a half-gallon. If you buy organic milk, that is a great price for a half gallon! 1) You will need to sign up for an account with Horizon to get that coupon. I’m sure you already know this, but you’ll definitely want to use a separate email for all these online registrations. You can get free accounts from gmail. 2) Although dairy is one of the most important categories to buy organic, we usually buy conventional milk without RBST hormones. It’s a compromise between what I think is best and what I can reasonably afford. I get the best price on non-hormone milk at Costco, where it’s between $1.97 and $2.20/gallon. That’s at least $.30 cheaper than Aldi and $1 cheaper than Walmart, and I’m not sure that they both certify no RBST. For my one year old’s whole milk, I do purchase organic. We took advantage of the sale and discovered that soymilk is actually less expensive at Target (add that to the price book) Also, I learned from a frugal mother that you can freeze milk (same is not true of soy milk) so can buy more of the organic now to use for later. It’s actually fun to be aware and comparison shop.